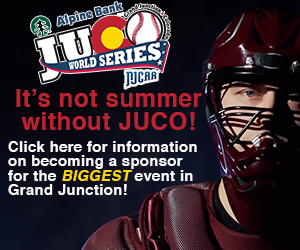 One of Grand Junction's main attractions, the 2018 JUCO World Series, is receiving some national acclaim. On Monday June 16th, 2018, Bryce Harper won the 2018 MLB All-Star Homerun Derby. Harper had to battle Cub's Kyle Schwarber who smashed 18 homers in the final round. Harper had the support of his father who was throwing to him and the hometown crowd, and he did not disappoint. The champions earn more awards: Chipola's head coach Jeff Johnson was named the 2018 ABCA/Diamond Coach of the Year in Division I Junior College baseball. Just days after the 2018 Junior College World Series, a number of JUCO players began the next chapter of their playing career. On Thursday May 31, Chipola pitcher Phillip Sanderson got the start against former World Series runner-up San Jacinto. Sanderson went five innings of shut out ball in the Indians 11-0 rout over the Gators. He ended the outing with a win on 73 pitches. The 2018 JUCO world series was a hit with great weather and even better baseball. After 19 games and a total attendance of 125,000, the Chipola Indians walked away as back to back National Champions. After Chipola's 10-7 victory over No. 1 Walters State, the Indians became the first team since 1999 and 2000 to win back to back JUCO World Series national titles. The 2018 JUCO World Series is in the history books as the Chipola Indians took the championship for the 2nd year in a row.